Frees up your hands so you can express yourself better, read to others, play cards, take phone messages, and more! Put your hands to better use with the Hands-Free Trutone Electrolarynx Holder. Now you can work with your hands and talk with your speech aid at the same time. This device holds your TruTone artificial larynx or SolaTone Electrolarynx so you can use your hands. 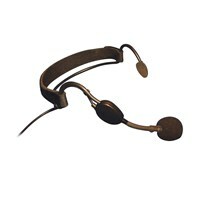 This holder works best with laryngectomees whose sweet spot is not too far from the middle of their neck. It must not be too low, also, because the chin must activate the electrolarynx. Sold separately (MaxiAids Item 049010), the Trutone Electronic Artificial Larynx (aka. 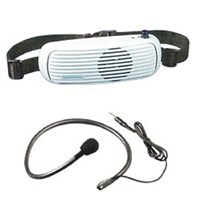 electrolarynx) for laryngectomees was designed to produce a superior quality voice. The Trutone Electrolarynx provides the user a convenient, durable and adaptable means to help them go about their lives more easily and independently. 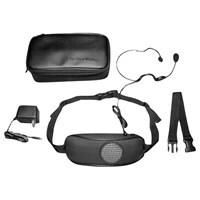 It has a wide volume range and comes with 2 rechargeable 9-volt batteries. Due to sanitary conditions, this product is non-returnable. The Trutone Electronic Artificial Larynx (a.k.a. 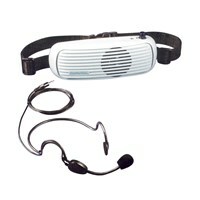 electrolarynx) for laryngectomees was designed to produce a superior quality voice. The Trutone Electrolarynx provides the user a convenient, durable and adaptable means to help them go about their lives more easily and independently. It has a wide volume range and comes with 2 rechargeable 9-volt batteries.